Because the weather is so wonderful, the deck is being rebuilt, and the vegetable garden calls, little time is being spent in the studio. 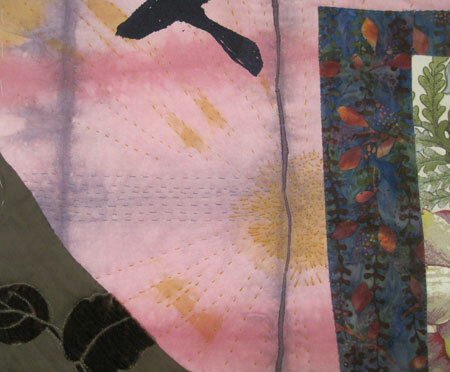 “Cover Lovers Askew” has been embellished with a fancy satin stitch and is ready to quilt and there she sits – waiting. Two Projects at the same time is fun, but the studio is a mess. 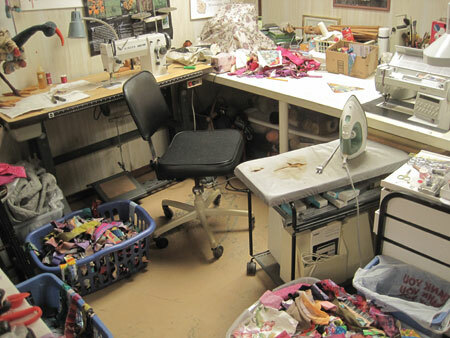 Note the two sewing machines. I’m trying to use both of them. The little ripped, worn out ironing board and my chair have to trade places depending on which machine I’m using at the moment. There’s an old Pfaff on the right and a big Singer commercial machine on the left; it has a wider needle swing and I’ve spent two days off and on trying to correct it’s tension. Almost there. 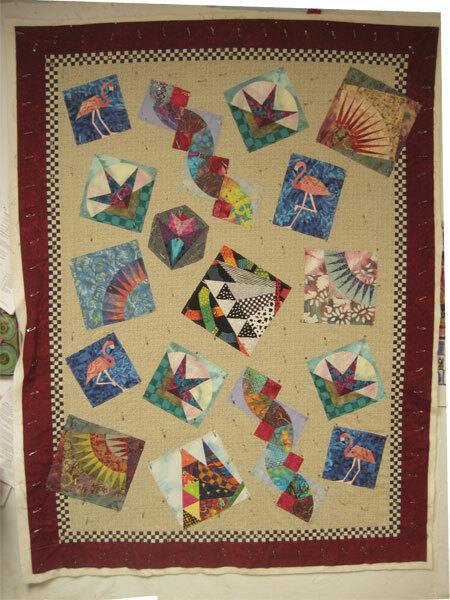 Cover Lovers Askew is now pinned and ready to embellish. 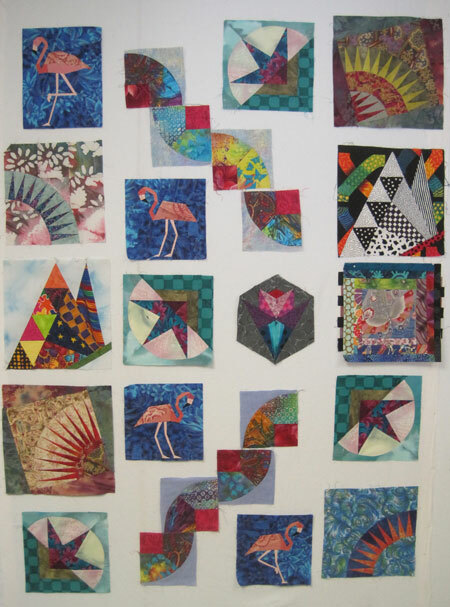 Flower Patch blocks – there are 14 so far, not enough room on the design wall to display them all and there will be more. 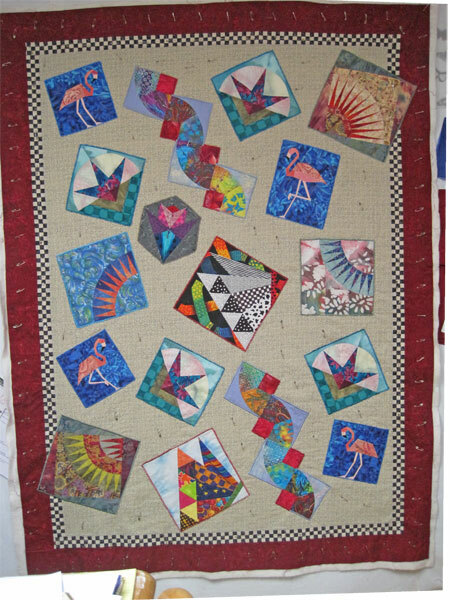 This is how they will go together using the QAYG (quilt as you go) technique. 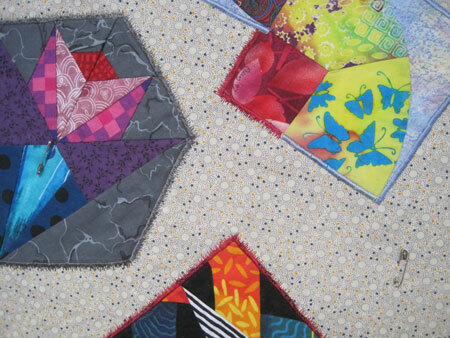 Marianne at The Quilting Edge blog has excellent “how to” tutorials on the technique. 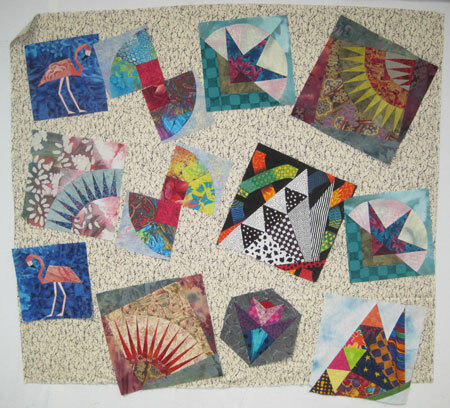 You may remember that one of my New Year’s resolutions is to make a quilt out of these blocks given to me by my old Florida friends, The Cover Lovers, about 15 years ago. 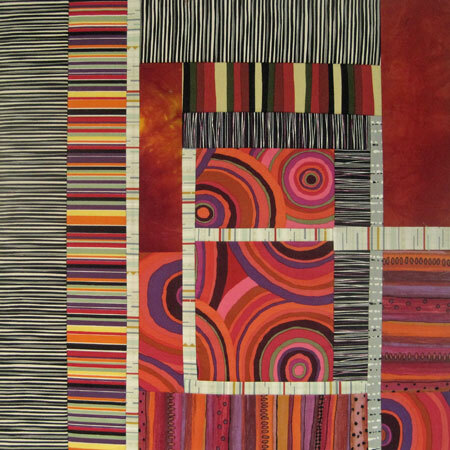 While looking for something to use as a background, I put this fabric on the design wall and slapped some of the block up, helter-skelter, just to see how they look on the fabric. Oh, wow. I just don’t have enough fabric and will have to find something else that is in the same vein. 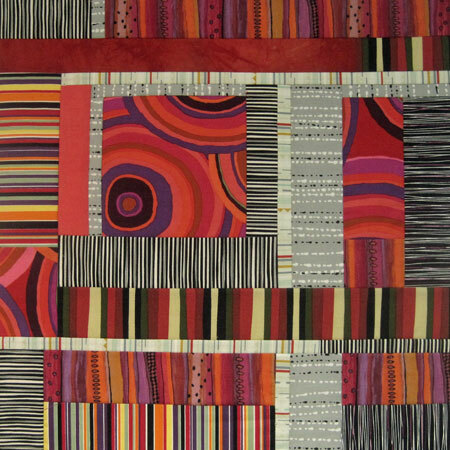 I like it that some of the blocks are askew and hang off the edge and could go on over into the border. My light bulb is lighting up!! One resolution is finished but I can’t show it yet, ’cause it’s a surprise. Since the last post, I’ve turned thebackground fabric 90∘and like it better. 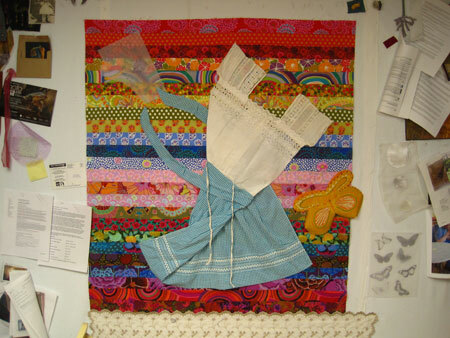 Then moved the apron and blouse toward the center. Now what will the apron “arms” do? I thought about butterflies, bubbles, and have settled on dandelions. 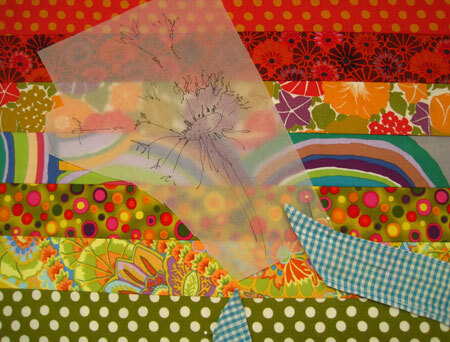 I’ve quickly sketched a dandelion on tracing paper and pinned it in the upper left corner. Not sure How I will depict it but some inspiration will come along. So many possibilities. 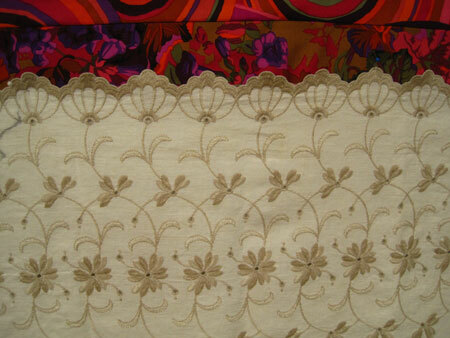 Machine embroidery, hand embroidery, silk screen, applique and embroidery. Ummmmm. And then in the top picture you see a table runner pinned to the bottom. Those flowers along the borders look too much like dandelions making it impossible not to incorporate it some way. You might think it’s too pretty to cut up, but there are stains and besides, think of it as a beautiful piece of cloth instead of as a finished product. Last week there were two areas on my current project that I was having trouble resolving. See previous post. One problem I worked out by myself while restoring in yoga. I know, I know; I’m supposed to relax during that time, but my brain never stops! 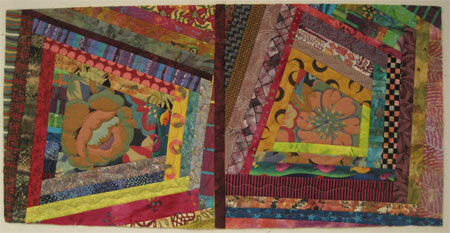 I hand quilted this area so that it is subtle but still stands out. 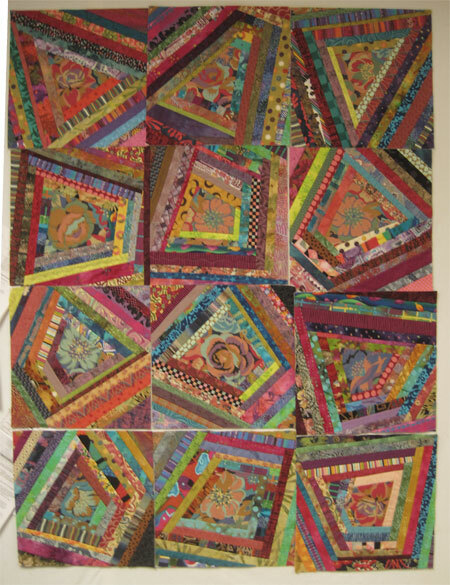 My art quilt group, Uncommon Threads, gave me suggestions for the other problem, one of which I took, thank you Lily, and the rest I worked out again in yoga restorative. I traced over the stitched writing, which was too pale, ever so lightly with a Sharpie pen and I will probably put the musical staff and notes on, with a pen. Have to go to Hobby Lobby to find the right pen. Any suggestions for a proper pen would be gratefully accepted!